Much has been written about the New Coke new product development and launch in 1985 and there have been numerous case studies published in various textbooks, along with numerous books. But what is different about this case study for New Coke is that students will role play a particular character or professional in their discussions, taking into account their goals and motivations. This New Coke case study is in two parts, part one (deciding the best competitive marketing strategy against Pepsi is outlined below) and part two (deciding if and how to launch a new product – that is, New Coke) is on another page on this website. Basically the information provided below will take the students back to 1985 to address the challenges that Coca-Cola was facing at that time. The character and role descriptions provided are based upon the real players and their generalized motivations. This New Coke case study role play exercise is designed for groups of six students. If there are more or less than six in each group, then the role of the ‘consultant’ can be dropped (for a discussion group of 5) or you can have two consultants (making a group of 7). For discussion groups of four, drop both the ‘consultant’ and the ‘sales rep’ roles. 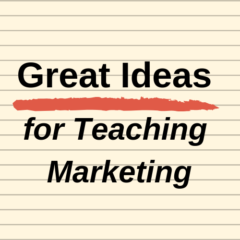 Allow student groups around 30 minutes to review the case, decide roles and discuss and debate their final marketing strategy. Then the ‘CEO’ of each group can present their strategy to the rest of the class. A summary discussion of the similarities and differences in strategy can then be conducted, making the whole exercise around 1 to 1.5 hours – but probably quite worthwhile for a better understanding of the New Coke decision. If there is general agreement on the need to modify Coca-Cola’s product mix in some way, then you can proceed to the second part of the New Coke Case Study. Please note that there is a page on this website that has links to relevant YouTube videos that will help students get a better understanding of the Coke-Pepsi ‘cola wars’ era. In 1985, Coca-Cola completely withdrew their flagship product from the market and replaced it with a “new” Coke in the US and some international markets. This product is often referred to as “New Coke”, but the intention of the packaging was to indicate that Coke was new. The product was developed and launched after years of R&D and taste testing and focus groups with consumers. The new flavor outperformed both traditional Coke and Pepsi in market research taste tests. However, within a few days of traditional Coke being withdrawn and replaced by “new” Coke, there was a backlash from consumers and the media and their brand image was damaged. Many consumers saw Coke as a cultural icon and were angry that it was no longer available. Primarily due to media and consumer lobby group pressure, within 80 days Coke re- introduced “Coke Classic” and offered two Coke variations along with “new” Coke. Today they no longer offer “new” Coke in the US market. The Coca-Cola product was the traditional market leader in the cola category. They had achieved success through a strategy of outsourcing manufacturing and logistics to licensed bottlers, strong retailer relationships, and building a very strong brand. In its early years, Pepsi positioned itself as a discounter and sold its product for half the price of Coke in a larger bottle. This positioning had some impact with budget-conscious households and helped Pepsi become the “at-home” drink, while Coke remained the social drink. To reinforce their perceived higher product quality, one of Coke’s slogans was “it’s the real thing”. Because of this initial relative competitive position, Coke believed their product was superior and that they had an entitlement of being the market leader. Whereas Pepsi always saw themselves as the challenger and tended to be more aggressive in their marketing tactics as a result. Pepsi reintroduced “the Pepsi Generation” advertising campaign in the early 1970’s. Pepsi had run briefly this advertising campaign in the early 1960’s. Its reintroduction was driven by John Sculley, who would later go on to run Apple and sack Steve Jobs. The Pepsi Generation advertising, along with the tag-line “The Choice of a New Generation”, helped position the Pepsi as modern, young, innovation and energetic. At the same time, it was designed to reposition Coke in the minds of the consumers as old, tired and boring. The Pepsi Challenge also started in the 1970’s has run off and on ever since through many parts of the world. The Pepsi Challenge consisted of a blind taste tests with consumers. These were filmed and the reactions of loyal Coke drinkers that chose Pepsi were shown as “reality advertising”. Over 300 of the Pepsi Challenge TV commercials (TVCs) were made, usually for local/regional markets throughout America. Occasionally deals were struck, at a university or college campus for example, for the university to switch to Pepsi if they won. Needless to say, Pepsi consistently won all the Pepsi Challenges – usually by a narrow margin. This period – 1970s and 1980s of aggressive promotions and comparative advertising between Coke and Pepsi is now referred to as the “Cola Wars”. 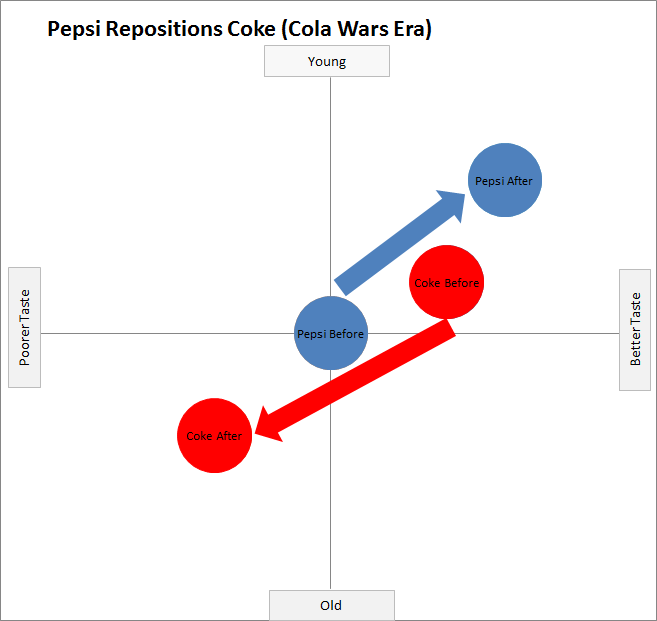 The cumulative impact of all these marketing activities by Pepsi against Coke were designed to reposition the brands in the minds of the consumers, as shown in the following perceptual map. Pepsi signed Michael Jackson to make two TV commercials and to sponsor his concert out just before “Thriller” took off – which became the biggest selling album of all time. The deal was struck for $5 million, which doesn’t sound like a lot of money today, but around that time the Rolling Stones tour only received $500,000 for their sponsorship deal. So this was an extraordinary amount of money to be paid to a celebrity for a sponsorship deal in the early 1980’s. Although not part of the original deal, Michael offered his biggest song, Billie Jean, to be reworded and used in the Pepsi TV commercial as he didn’t like the song Pepsi was planning to use. He was involved in editing the TVC. Pepsi started outselling Coke in the “free-choice” channels, such as supermarkets, grocery stores and drug stores as early as 1977. Pepsi was consistently closing the market share gap on the market leader, with Coke’s market share fell from 24.3% to 21.8% (down 2.5%) from 1980 to 1984. Coke was able to maintain its market share lead because of its distribution and retailer relationships (e.g. with McDonald’s and other fast food chains, extensive numbers of vending machines, relationships with restaurants, hotels, cinemas, airlines and so on). But Pepsi’s taste preference was impacting these contracts. For example, the Burger King chains switched from Coke to Pepsi in 1983. And to add to the concern of a falling market share for Coke, the overall soft drink market was in slight decline. Coke’s R&D area has developed a new cola formula that not only beats Pepsi and existing Coke in blind taste tests, but is cheaper to manufacture which would add up to a $50m pa increase to the bottom line. This New Coke case study is undertaken as a role play exercise, where each student in the group will take the role of one of the following participants. You are the final decision maker for group. Since heading Coca-Cola five years ago you have pushed push executives NOT to make safe decisions. Your culture change program has challenged management to be more entrepreneurial, but you always insist on analysis and professional decision making, with decisions tied to financial outcomes for Coke. You are the marketing manager responsible for the Coke brand. In 1982 you brought Diet Coke to market; the first ever extension of the Coke brand. It was hugely successful, becoming the 3rd best selling drink in the market, behind Coke and Pepsi, making it one of the most successful new products in FMCG marketing history. The cornerstone of Diet Coke’s success was its superior taste leveraged by Coke’s marketing expertise in brand building and distribution and logistics. You are considered a very ambitious and a highly confident marketing manager. As the marketing research manager for Coca-Cola, your prior taste test research for Diet Coke was spot on as Diet Coke became the best-selling diet soft drink on the market within two years, primarily because of its taste. You have also been reporting for several years that market research with consumers indicates that taste is the main factor for falling market share of the main Coke brand. You have just conducted an enormous market research study on the new formula for Coke. Almost 200,000 taste tests were conducted with a budget of $4 million. You have concluded that the new formula is clearly preferred by respondents in blind taste tests against both existing Coke as well as Pepsi. However, in research situations where the brand was disclosed to respondents, Pepsi was less preferred than in the blind taste tests. The only area of concern raised in your research was that in focus groups some consumers got angry at the idea of withdrawing old Coke, but this finding was not replicated in individual surveys where respondents were generally positive about the idea of a new better tasting Coke. You work as a sales representative for Coca-Cola. Your main role is to keep existing retailers and fast food chains committed to Coke, as well as trying to win new retailers and outlets. One of the challenges you face is that the competitive Pepsi sales reps highlight that consumers prefer the taste of Pepsi and that it fits better with a younger market. It was this kind of persuasive argument that helped convince the Burger King chain switch from Coke to Pepsi two years ago. You are generally excited about new products, such as the highly successful Diet Coke, but you did notice that many retailers stopped ordering Tab (Coke’s existing diet cola drink) due to the retailers’ unwillingness to dedicate too much shelf space to Coke products. You bottle and distribute Coke products in a defined geographic area . Your business is quite large in its own right and you employ many 100’s of staff. There are a few large Coke bottlers in the USA whose business is now worth more than $1 billion. Unfortunately, relationships between Coke and its bottlers were not always smooth. For example, a number of the bottlers took legal action against Coca-Cola to get a better deal with Diet Coke and some bottlers stopped manufacturing Tab (Coke’s existing diet cola drink) because it is a logistic challenge to manufacture multiple drinks. Bottlers pay 45% of advertising costs in your area, primarily for TV air time, and you weren’t happy with the huge Diet Coke launch AND the increase in advertising costs overall in recent years. As a manufacturer and distributor you don’t want lots of products to make and sell as a large-scale mass-produced streamlined operation is more cost-effective and profitable for your business. You are the one person in the case study discussion exercise that has no set agenda or existing motivations. Therefore, your role is to help the team reach the right decision for the firm overall and you may even act as the facilitator for the group. You are rational in your approach, but will force the other players consider both the up and downsides of their preferred solution. Outline why your proposed competitive strategy will be successful in this aggressive period of the Cola Wars. In what ways, do you think, that Pepsi may respond to your proposed strategy? When you have finished the above questions, the CEO can report their team’s strategy to the rest of the class.